I have created the most amazing birthday breakfast. 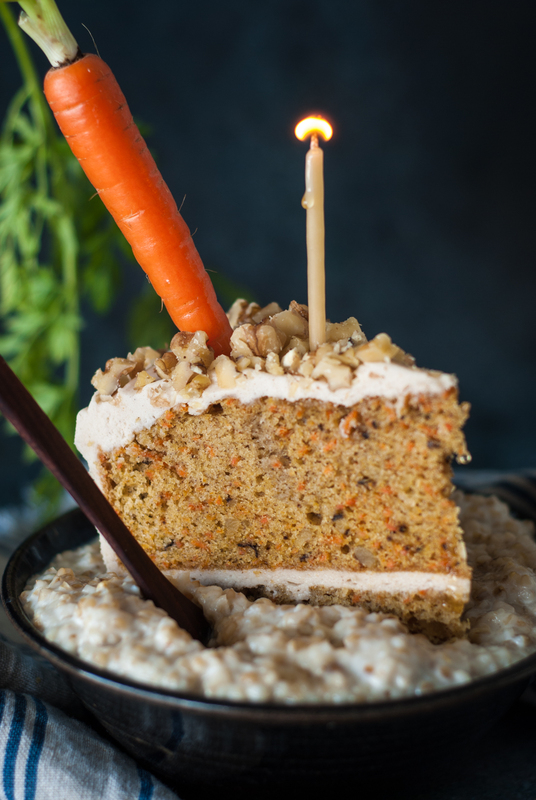 Carrot Cake Oatmeal – My Way! Today is my birthday! I’m celebrating the fact that I’m still alive! I’m healthy! I can run, not as fast, but I’m still hitting the pavement 5-6 days a week. I enjoy a few workouts at Orange Theory each week, which kicks my trash. Basically I feel like I’m 20 years old until I look in the mirror. Yikes! I try my hardest to eat as healthy as possible. I pretty much make everything from scratch. I avoid processed foods like the plague. I eat my greens and drink them too. On my birthday I give myself a gift of eating whatever I want. If I have a birthday cake, I go for Carrot Cake or Chocolate, Chocolate, double loaded with Chocolate Cake. 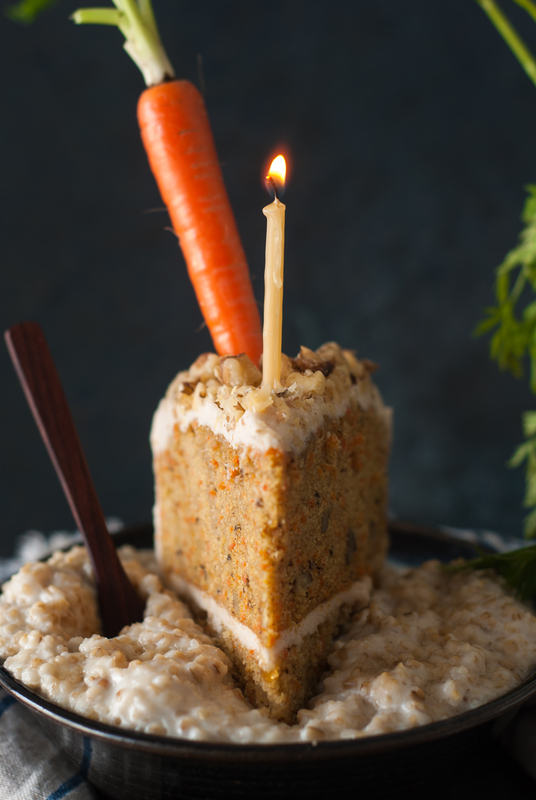 While perusing Pinterest for a great cake idea, I noticed many pins for Carrot Cake Oatmeal recipes. This turned on a light in my head. Wow! I love oatmeal and I love carrot cake. I can totally improve this recipe. 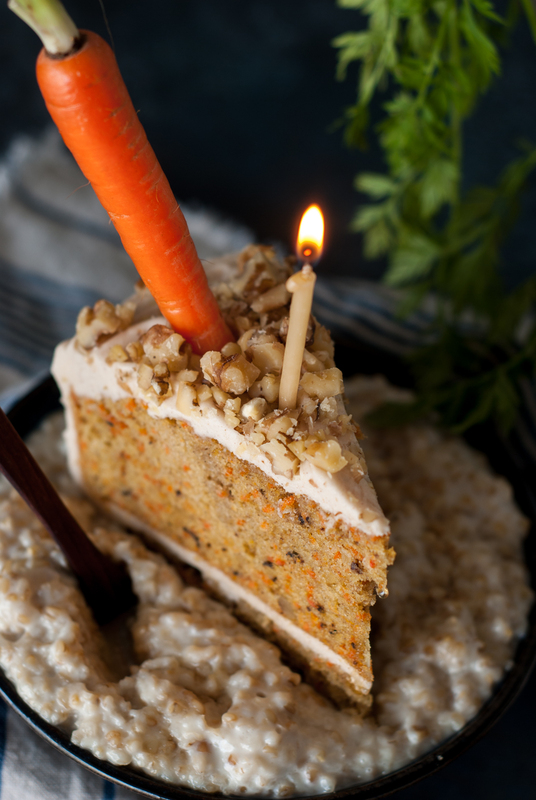 I can create the greatest birthday breakfast ever…Carrot Cake Oatmeal…MY WAY! Place one cup cooked oatmeal mixed with cream and maple syrup in a bowl. Top with a large slice of carrot cake. EAT! It’s not coincidence that it’s National Women’s Day on March 8th. To all of you wonderful women born on this day, GO US! I wish you a happy birthday. Celebrate in style because you are one fabulous woman! Oh…I think I’m going to be sick…. ooooh j'aimerais bien avoir la recette de ce gâteau (avec des mesures en grammes si possible) merci et bonne fête et …très joyeux anniversaire. would like to get the receipe of that marvelous carot cake (grams if possible) thank you for that an happy birthday! hugs!